HLS Cleaning are pressure washing and cleaning experts! We provide professional pressure washing services to residential, commercial and industrial clients throughout the North West and beyond. HLS Cleaning are Blackpool based specialists in driveway cleaning, patio cleaning and imprinted concrete restoration. We cover Blackpool and the surrounding areas of the Fylde coast and can apply our power washing equipment to most hard surfaces, restoring their brilliance. We would like to say that we offer the best patio and driveway cleaning in Blackpool. However, we would like that to come from you, the customer after we have demonstrated that our skill and knowledge of restoring and cleaning driveways and patios, cannot be matched. We specialise in patio cleaning, and no matter which type of patio surface you may have you can rely on us to carefully restore it to a previous life where it looked fantastic. HLS Cleaning also provide a re seal service for concrete imprint driveways / patios – resin based seal to protect and enhance the look of your concrete imprint. We can also re sand your block paving once cleaned. Roof Cleaning – HLS can provide a professional roof cleaning service to restore your homes roof to almost new; mould, dirt, algae and weeds can all be cleaned from your tiled or flat roofs; carefully selected equipment and water pressure specific to your tile and / or type of roof is used to ensure the best clean with no damage. You will be amazed at how good your roof can look. The entire Fylde Coast: Blackpool, Fleetwood, Cleveleys, Lytham-St-Annes, Poulton-Le-Fylde, Kirkham, Over Wyre, Garstang and Kirkham. Our professional pressure washing technicians are available throughout the North West; we use the latest high powered machinery; pressure washers and steam cleaners. Our technicians are IRATA (rope access) and IPAF (powered access) trained to ensure that we can access all high level areas if necessary. 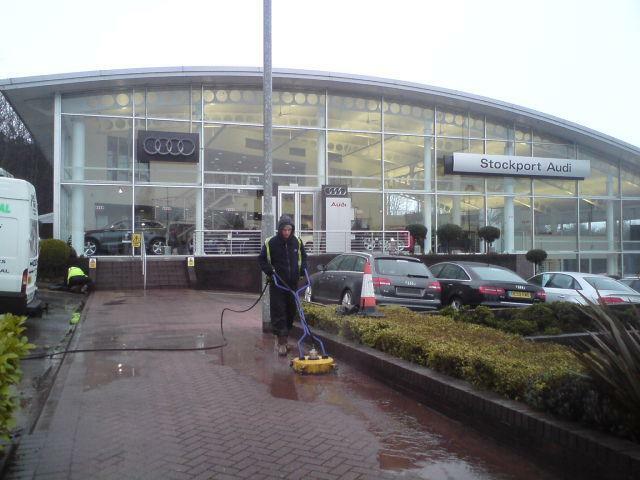 HLS provide a commercial pressure washing to business premises throughout the North west – trust in HLS to ensure that your premises looks as good as possible! 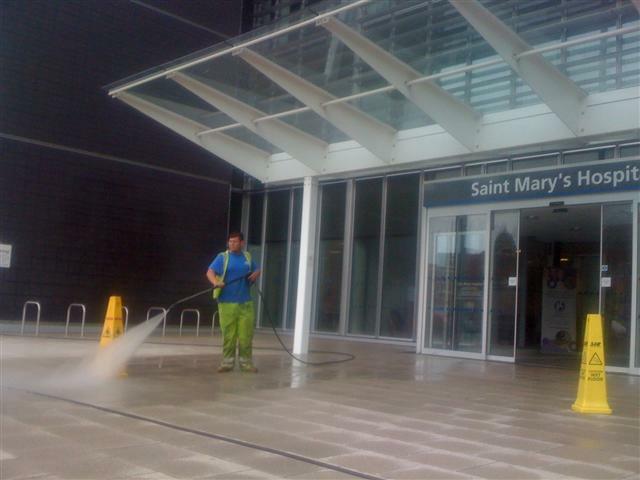 HLS Cleaning provide pressure washing to shops, restaurants, supermarkets, offices, Schools, Hospitals etc. We are often asked to ensure that the full public facing areas are immaculately clean; this is usually windows, signs, cladding and any paving or driveway areas. 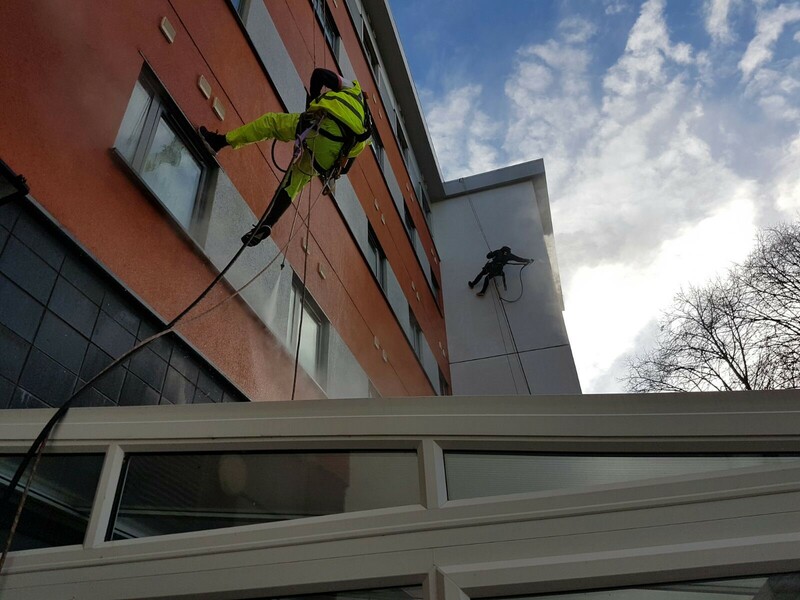 Cladding and Fascia Cleaning – HLS use our specialist pressure washing equipment to effectively clean all cladding and fascias of your business. because we are also work at height specialists we can ensure that all areas, no matter how high or difficult to reach are cleaned professionally. 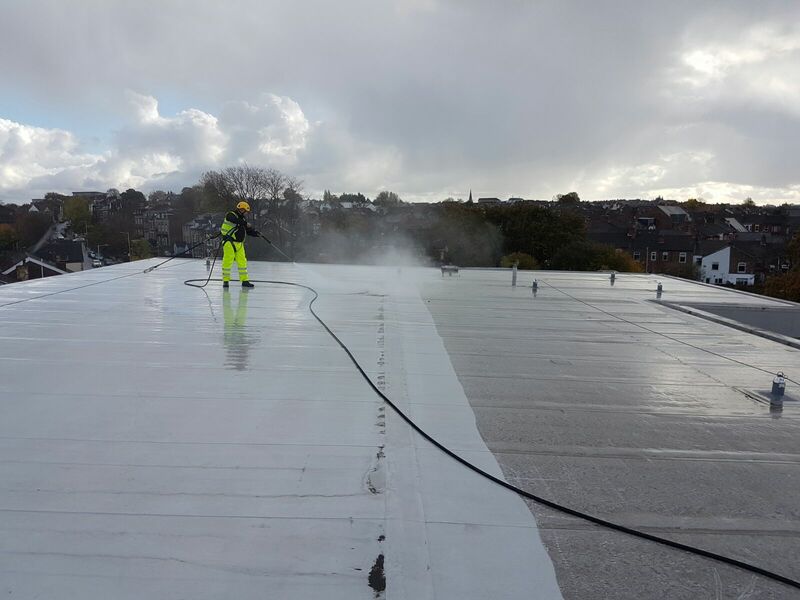 Chewing Gum Removal – HLS use specialist high pressure steam cleaning equipment to ensure that all unsightly chewing gum is removed from external areas; patios, driveways, forecourts, car parks etc. Graffiti Removal – HLS use specialist high pressure steam cleaning equipment to remove any and all graffiti from the walls or floors surrounding your premises; graffiti can be professionally removed from any type of surface whether this be brick, concrete, cladding or metal. Car Park Cleaning – HLS provide a car park and forecourt cleaning service; this can be undertaken on a contract basis, i.e. to ensure that your premises looks clean throughout the year. All surfaces can be effectively cleaned, ingrained dirt, mould and algae can be removed as well as weeds and litter. Artificial Grass Cleaning and Astro Turf Cleaning – HLS apply our specially designed and made artificial grass and astro turf cleaner to your surfaces and, combined with steam cleaning technologies, wash away all dirt and grime leaving your artifical grass and astro turf looking restored and brand new. Our professional industrial cleaning team is capable of undertaking pressure washing works on an industrial scale. Our multi skilled team compromising of, IPAF trained technicians, IRATA trained rope access technicians, confined space rope access technicians and professional, experienced cleaners ensures that we have the resources and skills to undertake any industrial commercial cleaning or pressure washing works. Here is our newest, youngest 😉 and brightest member of the team Paul using our BRAND NEW scater machine to pressure wash this concrete loading yard. HLS operates only the best pressure washing and steam cleaning machinery to enable us to achieve fantastic results on any industrial, commercial or residential premises. To discuss our Pressure Washing services please Contact Us. HLS Cleaning are capable of operating up to 150 degrees with steam and use a DOF system for sensitive cleaning on historical buildings / areas. We can utilise two pressure washing systems and two steam cleaning systems, both mounted in our van for speed and efficiency. All pressure washing technicians hold Powered Access Licences (PAL) (IPAF) and valid CSCS Cards.